Is it possible for things to go too well for a drugmaker’s most important franchise? That’s an important question for Merck & Co. Inc. It announced first-quarter earnings Tuesday, and immune-boosting cancer drug Keytruda was the star. The drug’s sales more than doubled from the same period last year, and helped prompt Merck to boost its full-year earnings and sales guidance. But Keytruda’s success has convinced Merck to commit heavily to the medicine, to the risky exclusion of other efforts. The strategy makes sense to a certain extent – Keytruda sales are growing rapidly, and recent trial results have made it a clear leader in lung cancer. Drugs with the potential to generate more than $10 billion in annual sales are unicorns. Only AbbVie Inc.’s inflammation drug Humira has consistently managed the feat in recent years. And the category of medicines to which Keytruda belongs – so-called PD1/L1 inhibitors – requires commitment to succeed. The FDA has approved these drugs to treat a broad array of cancers. Five of these drugs are currently on the market, which creates heavy competitive pressure to rack up as many FDA approvals as possible. Merck and its rivals are also running hundreds of trials attempting to combine these drugs with other medicine, hoping to kill tricky cancers and help a broader array patients. As a result, Merck’s trailing 12-month R&D spending has increased by $4 billion in the past year. 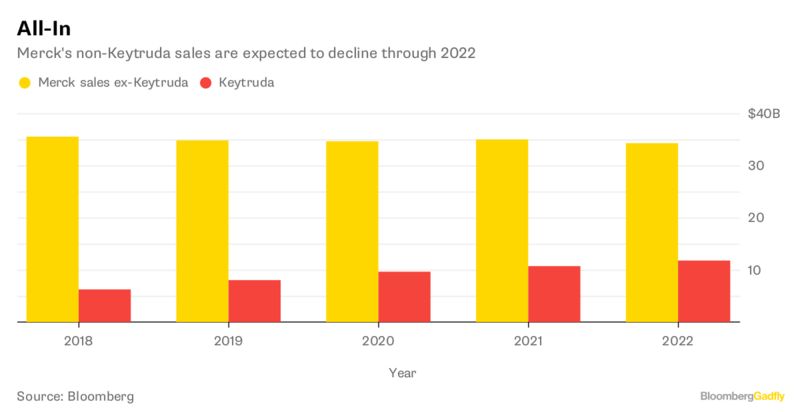 By 2022, analysts expect Keytruda to account for at least a quarter of Merck’s total sales and the vast majority of its sales growth. If anything, such numbers downplay Merck’s future dependence on Keytruda. Its second-largest franchise – diabetes drugs Januvia and Janumet – is beginning to decline. Merck has many other older products, and its non-Keytruda pipeline isn’t terribly exciting. Merck’s Keytruda dependence is risky. One cautionary tale close at hand is Bristol-Myers Squibb Co.’s Opdivo, which seemingly had a clear and durable lead in this market just 21 months ago, until lung-cancer struggles and Keytruda’s success flipped the script. Sanofi and Regeneron Pharmaceuticals Inc. could get a sixth PD1/L1 inhibitor approved later this year. This market is likely to get so crowded and price-competitive that it will be increasingly hard to keep a lead for long in any given tumor type. Keytruda’s long-term future depends on maintaining a leadership position if and when combination approaches become standard. While Merck is spending aggressively to make sure that’s the case, it’s entirely possible another company will make a combo breakthrough and erode Keytruda’s sales potential. The once-promising combination of Keytruda with Incyte Corp.’s epacadostat may be a total flop. Since its $8.3 billion acquisition of Cubist Pharmaceuticals in late 2014, Merck has been pretty quiet on the M&A front. Several of the small deals it has made have been aimed at finding new combo partners for Keytruda. on deals with AstraZeneca PLC and Eisai Inc. for part-ownership of some cancer drugs. Those will generate some revenue in their own right, but may only really pay off if they prove to work well with Keytruda. Merck defended its pipeline on its earnings call and said M&A is a priority. But actions speak louder than words, and Merck hasn’t done much lately other than double down on Keytruda. The recent struggles of other companies highly dependent on key drugs – see Celgene Corp. and AbbVie Inc. – suggest Merck’s diversification efforts should be as aggressive and broad as its Keytruda spending.